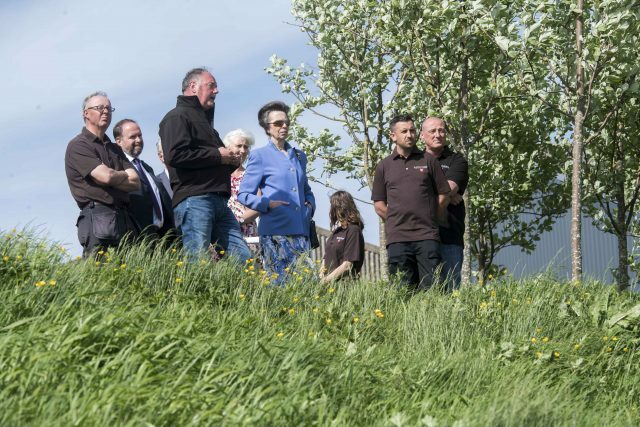 Princess Anne paid a royal visit to Rathfinny Estate in Sussex this week as the winery prepares to launch its first sparklers. The princess flew in by helicopter to the Rathfinny in Alfriston, Sussex, to officially open the new bottling and cellar buildings. The visit came just as Rathfinny prepares to release its first range of sparkling wines produced from grapes grown on its 210-acre vineyard, and its new multi-million pound facility will provide space to bottle up to 80,000 cases annually. Thanks to a change in the law which will come into effect after Brexit, the winery plans to use 800 imperial pint (56.8cl) bottles to bottle its Blanc de Blancs, which is due to be disgorged in 2019. EU rules restrict sales of sparkling wines (not still wines) to bottle volumes of 37.5cl, 75cl and multiples of 75cl. The winery believes it’s unlikely that the pint bottles will be on sale before 2021. Princess Anne greeted staff and discussed viniculture, before unveiling a plaque to officially open the view buildings. Anne also met with representatives from fellow Sussex winery Ridgeview, which recently appointed Rory Loftus, a 23-year-old former chef who worked under Nathan Outlaw, as its new assistant head winemaker.